Great outside space and huge clean pool. Loved the outside kitchen. Lots of room. Secure and quiet area. Great for young kids. Back area spoilt with building materials and tools (dangerous) and overgrown weeds. Inside villa was clean and air con in all bedrooms is great. Villa full of owners personal belongings which is very uncomfortable- family photos, clothes, toiletries, car in the drive and even a dressing gown on a door !!! Needs to be a neutral space if renting. Would be the perfect villa with a couple of days work tidying, doing small repairs and removing personal stuff. We are glad that you enjoyed your stay at our villa. It is normal practice for owners to have some of their personal belongings around however, these are stored in places not used by guests such as the top cupboards above the wardrobes. There are some family photos on the wall in the living area, some of which the owner has agreed to store away. Although rare the owner had left his car on the driveway however, this was covered up and there was ample room for a further 3 vehicles to park off road. We agree there were a few weeds and small amount of covered building material at the rear right hand corner of the property out of the way of any foot traffic. The small amount of weeds in the same area have been removed and the owner will be moving the building material. We feel this is a great villa, as shown by the fantastic photos on the website which were taken the month before your visit which show the villa exactly as it is, which is why we feel the 3 star rating is unfair. We thank you once again for staying with us and hope to see you again soon ! 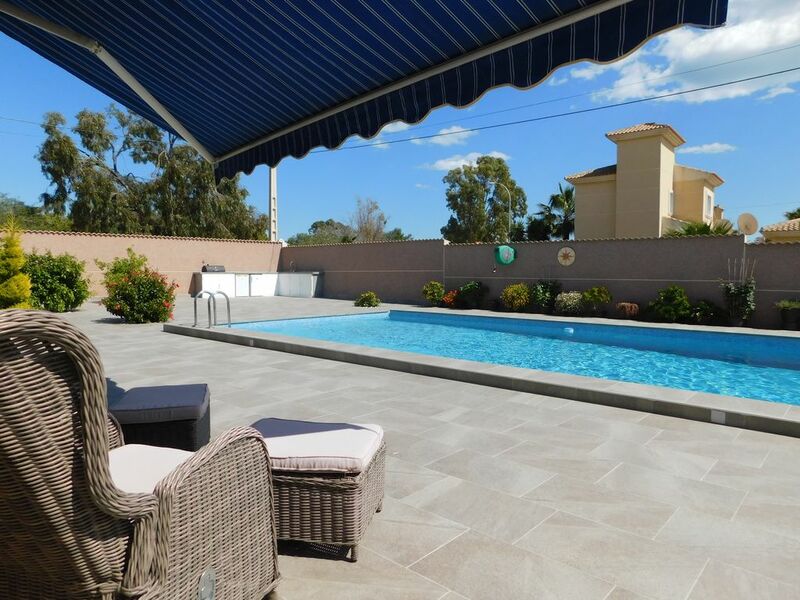 What a great villa in Torrevieja! Beautiful and clean villa with enough room for eight people. Large and functional yard with plenty of resting areas. Large and well maintained pool. I totally recommend this villa for a visit. La Siesta est une zone résidentielle établie tranquille à la périphérie de Torrevieja. Les propriétés typiques à La siesta sont des villas avec leurs propres piscines privées. La Siesta a sa propre sélection de restaurants, cafés et bars, supermarché, magasins, banques, etc. Il y a un petit petit parc aquatique (ouvert de mi-juin à mi-septembre), il y a un bon service de bus dans le centre de Torrevieja. Accès facile à Alicante (50 minutes par la route) et Murcia (30 minutes par la route) Aéroports.